For years Dan O’Brien raised cattle on his ranch in the Black Hills of South Dakota. After enduring beef’s punishing boom and bust cycle and experiencing first-hand the environmental toll that cattle took on his land, O’Brien made a dramatic change. He started raising North American Bison*, the great icon of the Great Prairie, instead. A former conservation biologist and a celebrated novelist, O’Brien wrote about the travails and benefits of the switch in his 2007 memoir Buffalo for the Broken Heart: Restoring Life to a Black Hills Ranch. In the book, he weaves personal stories of South Dakota ranch life with an ongoing critique of industrial farming and the way it has degraded a once pristine and ecologically-critical landscape. This month marks the release of O’Brien’s book Wild Idea: Buffalo and Family in a Difficult Land. 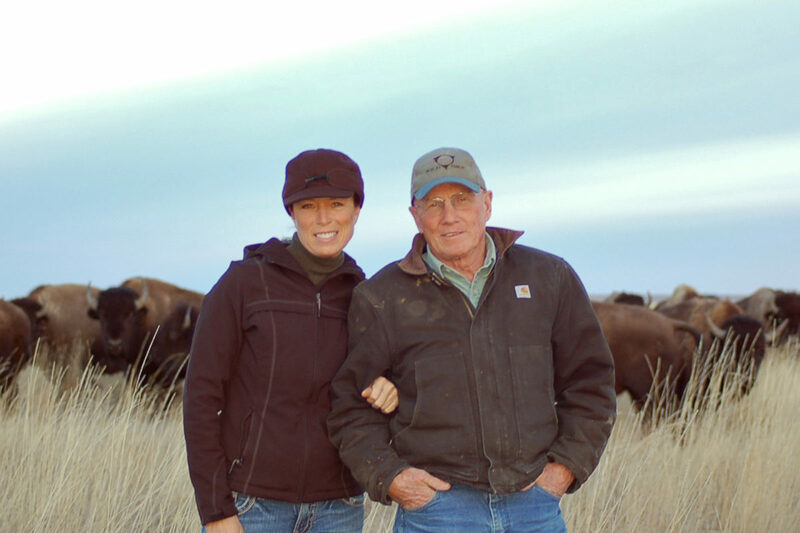 In it O’Brien chronicles the efforts undertaken by he and his wife Jill to start the Rapid City-based Wild Idea Buffalo Company, where they sell their bison directly to customers via the Internet. The O’Brien’s bison graze only on native grass and their grazing patterns leave the prairie much better off than those of cattle. They are also harvested in the field using a custom mobile slaughter system to ensure a humane, high-quality product. While an estimated 20-30 million American Bison once roamed the nation’s prairies, that number has dropped to fewer than 30,000 in wild, conservation herds. We spoke with Dan recently about his book, his business, and the bison that inspired them both. Aside from people’s natural tendency to eat what they know, what’s the biggest barrier to scaling buffalo production to make it mainstream meat? There aren’t that many places where buffalo can be raised in the way we think they should–that is on a large-scale landscape, where they’re on grass all the time. Americans are used to spending very little on food for the past 50 years, and considering the high cost of producing ethical buffalo, do you risk alienating regular eaters? Do you ever see a world where McDonald’s sources buffalo? This is one of the cruxes of the problem and it often gets too complicated for the average Joe and they end up throwing their hands up and ordering another Big Mac. The truth of the matter is our cheap food policy is the most expensive policy we could have initiated. When you figure in the health impacts from [industrial food] and figure the cost of obesity, diabetes, and heart disease, you would be way ahead [if you bought] line caught salmon and Wild Idea Buffalo. Way ahead. Would buffalo be more accepted as mainstream food if it were part of a storied, regional culinary tradition? I’m not sure it is a problem. It’s a traditional agribusiness tact to say you’ve got something good now let’s produce as much as possible. There isn’t enough available land for the right type of buffalo husbandry, so you’re never going see buffalo burger stands. They kill more cattle in one day than there are buffalo in the world. It’s not like we’re going to triple our buffalo production–it ain’t going to happen. It’s for special occasions–Thanksgiving on steroids. It’s also important that we don’t traffic in the mythology of the buffalo, but instead try to live up to the mythology. A couple of times a year we order a lobster from Maine for family events. It’s not everyday sustenance. You’ve written about neighbors who view the prairie as a factory. Is that belief that we’re here just to take a big part of the barrier to a more sustainable food system? With the industrial revolution came the idea that we would take something like agriculture and turn it into an industry–a very strange idea. It’s like turning churches into an industry; we’ve done that too. The idea of capitalism as it’s practiced today–where more is always better–won’t work when we have limited resources. Something’s got to give, and we’re seeing it in the health issues we talked about. Can you say more about the way you’re working to make the “harvest” or slaughter of your animals humane, ethical, and transparent? I’m playing with the idea that we should advertise that we will let anyone into any part of our operation and challenge any producer to do the same thing. If a producer doesn’t want me to see how they deal with their animals, I don’t want to eat it. The agriculture lobbies exert tremendous influence over food policy in Washington, but they seem to have very little presence in the buffalo industry. Maybe the buffalo industry should grow, but it should have limits. It just came out that USDA is going to do their first official bison study. But I have mixed feelings about Washington; I mean we’re busy raising buffalo here. Who has time to lobby? This is not a meat market deal, this is an Internet business and that’s how we run it. What we’re doing is a new paradigm. I don’t even want to know how the beef industry does it. What about programs that pay for environmental benefits like carbon sequestration on pasture lands that could be an additional income stream for your operation? Well, if we could get something along the line of cap-and-trade for carbon sequestration through perennial grasses that would be a fantastic thing for sustainability, for habitat, and for species diversity–all the things that really matter today. Buffalo for me are an icon. What I’m really interested in is species diversity and sustainability in the Northern Great Plains and you really can’t think about that without thinking about buffalo. What do you make of the Eastern South Dakota’s recent land conversion and the westward encroachment of commodity agriculture in the state? The money is huge, it’s subsidized, and it’s corrupt. I’m convinced there’s a whole bunch of farmers who really don’t want to follow the industrial agriculture model but they’re stuck. What is better suited for climate change—the buffalo or the cow? I like cattle; I used to raise them. There’s plenty of room for both. But when you talk about the climate equation on the Great Plains, you’re talking deeply rooted perennial grasses. And beans and corns are anathema. Perennials hold their nutrition way better, too. Cattle also hammer riparian zones and that a big deal. Basically buffalo are the friend of species diversity and that we can document. Aside from the ranch and family, what keeps you in South Dakota? I love to walk across native pasture. I’m basically a grouse hunter, but I don’t care if I get any grouse or not. It clears my head. It’s my elixir, my golf. And South Dakota has it and New Jersey doesn’t. * Although the choice to do so is debatable in some circles, this article uses the terms “bison” and “buffalo” interchangeably. Excellent article! I fully enjoyed and celebrate very much people like Mr. and Mrs. O'brien who understand the importance of preserving our natural world with environmentally friendly farming practices. I would love to be able to visit a place like their ranch in my lifetime. Being from a small Caribbean Island like Cuba it is hard for me to wrasp the concept of vast open country like that of the South Dakota prairies. Great article again! Kim -- longtime food and farm columnist Alan Guebert made some of the same arguments on word choice lately. Thanks for reading. I was quite pleased to see someone with a plan to have a sustainable heard of bison and a good marketing idea.This shows good old American thinking ,with a product that is a little outside the box.Hopefully it will prosper and be successful.Just watch out for government help.I know from past experiences in the eightys when i raised cattle that a little government goes a long way. I had been looking into doing a bison ranch myself. Like to have some questions answered if you have the time. Loved your book. Would like to come visit your ranch this June, how do we set that up.